We explore our different bodily systems and how they enhance our consciousness and awareness using movement, touch and anatomical investigations. 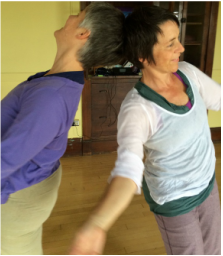 Gain greater mobility and postural focus through this nuanced understanding of the body. Contact Improvisation is a dance form based on moving spontaneously while maintaining contact between one or more people. The form teaches us how to support and be supported, how to be off-balance, what it means to feel ready, and trusting yourself all the way to the floor. A gender-neutral, social dance form, CI invites gravity, weight-bearing, and counterbalance explorations that help us navigate ourselves in space and in relationship.